This year my cello is celebrating its 300th birthday. Made in 1716 by Jacques Boquay, I call her Ima, as in “I’m a Cello” because whenever I fly with her I book the ticket as Ima Cello. That way I collect the frequent flyer miles and get a free meal! When I was younger it was a lot easier to travel with a cello—in fact when I lived in Germany, I used to fly with Swiss Air and they usually just let me take Ima on the plane without paying for a seat. Later I bought a big Kolstein travel case—it is huge and bulky, but it has an inflatable “balloon” that surrounds the cello inside the case and is made out of Kevlar so you can shoot a gun at it and it won’t pierce the case. Ima traveled with me all over the world—to Europe, Asia, South America, Africa and New Zealand—but it always came out of the case in perfect condition. Sometimes I felt like it came out more in tune than when I put it in! 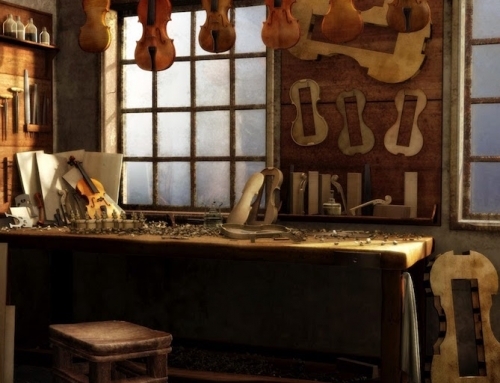 Jacques Boquay was the first important violin and cello maker in France. He lived from 1680-1730, and worked in Paris on the Rue d’Argenteuil, which still exists close to the Opéra Comique. The family lived in two rooms above the shop. His wife was Suzanne, and he had a daughter and a half-brother, Louis Guersan, who was also a luthier, as well as an assistant, Antoine Véron, and a worker, Treuillot. After he died, at age 50, his wife married his assistant Veron, and continued the shop. Boquay is better known for his cellos than his violins or violas. I have had the cello for about 40 years. I was beginning my professional life, having already served as principal cellist of the Orquesta Sinfonica de Las Palmas, in the Canary Islands, Spain. But I needed a better instrument than the Ettore Soffritti cello I was playing. 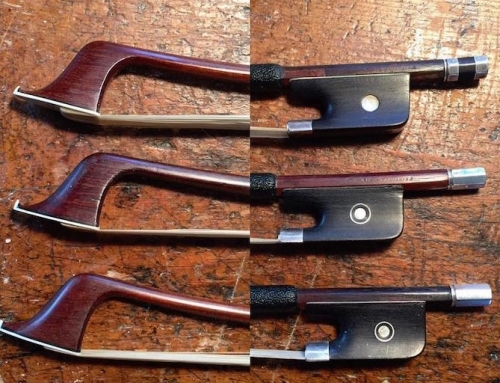 I searched violin dealers in NY, Chicago, and visited Moennig’s in Philadelphia several times. But I never found the right cello for me. Finally on one visit to Moennig’s they showed me a few cellos but again nothing clicked. I was about to leave, and asked if they didn’t have any other cellos I could try. I was told that there was one more—a small-sized instrument. They brought it out, and I fell in love! The Boquay had the warm, round sound I was looking for, and since my hand is not huge it seemed to fit me perfectly. I have been playing it ever since. 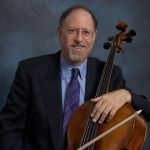 Some years after I had become a professor of cello at the University of South Carolina, I was told by a local cellist that he had heard there was another Boquay in South Carolina at, of all places, Bob Jones University in Greenville. I made an appointment to go there, and found that BJU had been given their Boquay in the 1940’s as a bequest. It had been sitting in a locker for most of those years, and was not in good condition. Their cello was made in 1712, so four years earlier than mine, but it was clearly made from the same wood and had very similar proportions. 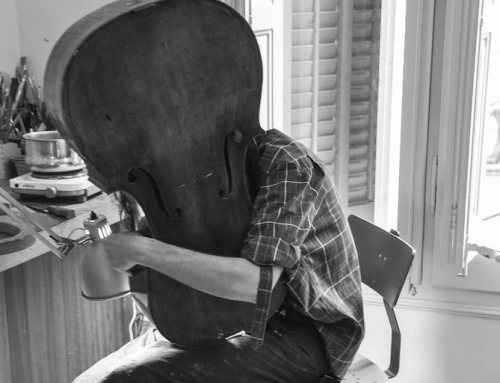 It was really the long-lost brother of my cello. I told the Dean at BJU what he had, and about how much it might be worth. A few weeks later I got a call from the Dean asking if I would be interested in buying it—which I did, for a great bargain price. Of course it was not in playable condition and needed renovation. 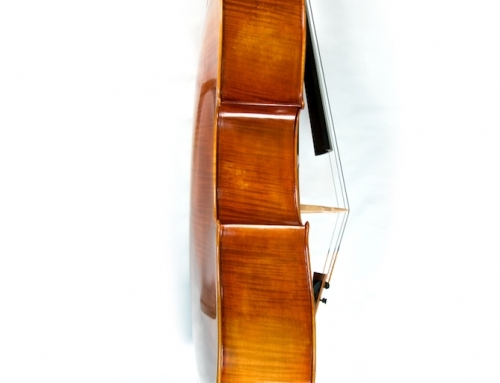 I eventually had it restored, and used it as a Baroque cello for many years. As I mentioned, I have travelled all over the world with Ima. In 1983 I spent six months in China, touring and teaching. I was one of the first cellists to go to China since the Cultural Revolution, and I had the opportunity to travel all over the country playing recitals and working with orchestras. (For a full description of that experience, go to an article I wrote in the American Music Teacher journal, “Cellist in China”). In February I flew from the cold and dry northern city of Taiyuan to the very hot and humid city of Guangzhou. Days before the concert, I had shown my Boquay to Xu Fu, an up-and-coming violinmaker in Guangzhou. They had never seen an 18th century cello in person before. He and his associates studied Ima and took pictures. On the day of the concert, the cello suddenly cracked—and it continued opening a 6-inch gash on the top of the instrument during the concert. It was perhaps the worst experience in my professional life. As I was playing, the crack opened more, and the beautiful sound was lost. After the concert I had to decide whether to just leave China, or to let Xu Fu do the repairs. I decided on the latter—and I went across the border to Hong Kong for a week. When I came back the work was finished, and he had done an excellent job in repairing Ima. When I came back to the States I took it to Moennig’s and they said the crack was perfectly repaired—they only needed to do some cosmetic work on the top. Thirty years later I was in China again with Ima in 2015, with a residency and recitals in Lanzhou, Baiyin and Beijing. It is unbelievable how much the country has changed during that time. On another trip, in 2001, I led a delegation of string players and teachers to Cuba as the past-president of ASTA. On that trip I almost caused an international incident. I gave a cello master class at the Conservatory in Havana. 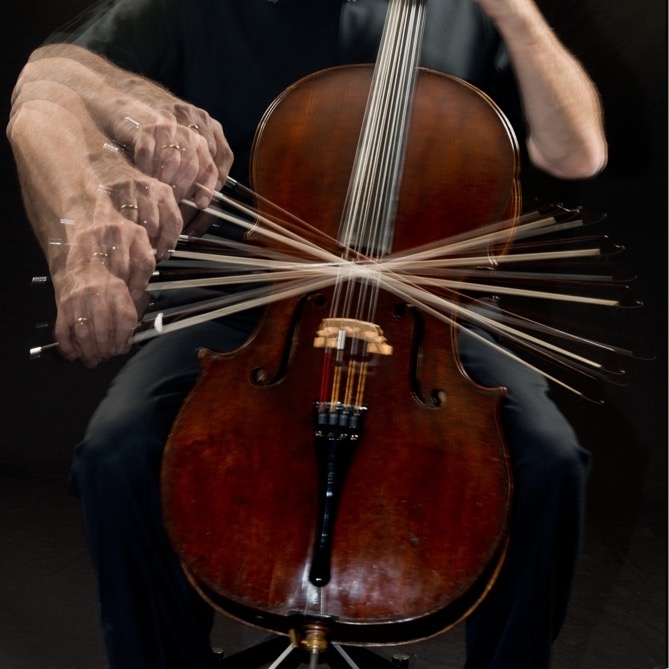 A student played Bach’s Sarabande from the G-major cello suite, but he played it in duple meter by holding notes too long. I asked the student if he knew anything about the history of the sarabande dance. He didn’t, so I told him that the sarabande is in triple meter, with the accent on the second beat, and how it originated right there in Havana before being brought back to Spain. As I explained that it was considered to be a lascivious dance because men and women actually touched, I could see the front row of professors talking agitatedly with each other. After the class one of the professors came up to me and asked why I was giving such false information. I was shocked that they did not have this basic knowledge, and that night I called my wife and asked her to fax us a few pages about sarabandes from the Grove’s dictionary. Apparently because of the embargo, musicians in Cuba had not had access to basic musicological information and research since 1959, and they had no idea about the history of the sarabande. Ima and I have had many other adventures together—including losing her soundpost on a bumpy dirt road in Brazil while going to a festival near Porto Alegre, and playing the Tchaikovsky while on the Trans-Siberian railroad as we journeyed for five days across the Steppes of Russia. In fact, Ima has circumnavigated the world! We also lived through an earthquake and a sandstorm together, as well as spending several weeks in residencies in Taiwan, Korea, and England. Ima and I have played much of the cello-piano literature, including complete Beethoven cycles and all the Bach Suites. We have also enjoyed the company of other musicians in chamber music and concerto performances. It was a delight to be able to preserve the work of art which was crafted in Paris around the same time that famous Italian counterparts lived and worked in Cremona. This extensive restoration took about two months to complete. Boquay is a very characteristic maker in his own merit. He does not use any particular well-established pattern. The overall size is very small for being a full-size instrument, the choice of maple for the ribs, back and the scroll is rather ordinary instead of carefully selected curly flame, the top plate has a very evenly grained spruce. The varnish is oil based, with rather dark brown tones. Boquay did not shy away from leaving a few minor visible tool marks. 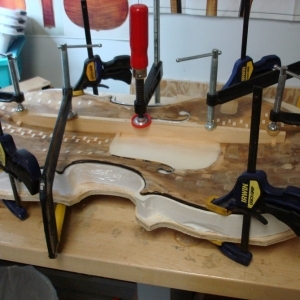 Dr. Jesselson’s cello had structural problems that needed to be addressed. The arching and the bass bar had become deformed significantly due to forces of the bridge and strings. A couple of internal reinforcements and cracks have come unglued. The edge of the top has been weakened by numerous openings so that the edge needed to be reconstructed in the process called doubling. The internal restoration of the top plate utilized numerous advanced techniques including special arching, de-warping, installation of numerous patches, re-installing cleat supports, crack repair, and the newly properly positioned bass bar. To our surprise, the most interesting part of the restoration was the discovery of the so-called “through patch” in the bridge area. As the warm sand bags were applied to the arching correction process, the heat from the sand had warmed the patch so it came unglued. The “through patch” refers to a new piece of wood inserted and disguised into the middle bridge area which has had a total sound-post or bridge protrusion through the top plate. The “through patch” was so well-hidden, but after the heating it was very visibly obvious. I ended up installing a new “body patch” to reinforce an entire bridge and sound-post area, followed by extensive varnish work to make everything look as if no “through patch” was ever there. A few weeks ago I celebrated Ima’s 300th birthday by playing a recital with pieces from 1716, 1816, 1916 and we commissioned a piece from this year, 2016. The composer of this piece, Mandy Fang (Fang Man), listened to me play Ima and then wrote a work inspired by a lullaby that my grandmother, Oma, had sung to me when I was a baby. Oma had made up a different lullaby for each of her grandchildren, and I still remember it more than 65 years later. The piece from 1716, the year of Ima’s birth, was by Jakob Klein. I had never heard of Klein, but in researching the music for the recital I came across his sonatas. They are very charming and should be played more. They are among the earliest sonatas for cello (and are a few years earlier than the Bach solo suites), sounding a bit like Vivaldi or Marcello (although they were written earlier than those pieces also). They have never been published since the original 1716 publication, so I used that first edition, and we played it with harpsichord and bassoon continuo. Interestingly, these sonatas are written scordatura, so the cello is tuned to B-E- A-D in order to sound more brilliant than he standard tuning of today. I have been privileged to have had a forty-year association with Ima, and hope to have many more adventures before I pass her on to the next cellist who will enjoy her company!